New Jersey’s Fetty Wap is on the fast track to having a year like Rae Sremmurd did in 2014, with his cocaine-cooking anthem “Trap Queen” rising on the charts. (It currently sits at No. 3 on Billboard’s Hot 1oo.) And while it’ll probably hit No. 1 too early to give “Trap Queen” a shot at Song of the Summer, Drake has intervened to assist him in having a better chance at that title. Just as he did for ILoveMakonnen with last year’s “Tuesday,” he’s hopped onto Fetty Wap’s next single, the equally infectious “My Way,” for a remix. Much like Kanye West’s earlier this year, it’s an important co-sign: “Tuesday” shot up the charts with Drake’s help, and remixes from Nicki Minaj had the same effect for up-and-comers like Young Thug and Rae Sremmurd last year. Even without a Drake verse (which contains James Harden references and throws shade at an ex, as usual), “My Way” would’ve had hit potential. 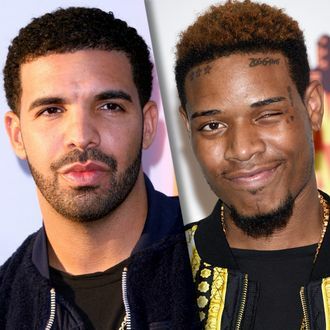 But expect Fetty Wap to evade one-hit-wonder status because of it. And in case you need more Fetty Wap in your life, here he is doing “Trap Queen” on Fallon last night with the Roots. Enjoy!